Many people may have reluctantly abandoned pasta as a part of their diet, in order to lose weight and become healthier. Giving up this food could be related to the steadily-emerging role of carbohydrates in the development of obesity. However, a paper published recently in the BMJ Open journal demonstrates that pasta is really not so bad for the waistline. This research is a systematic review of the effects of pasta consumption on health-related outcomes. Scientists investigating this study found 32 clinical trials on the subject that involved over 2440 participants. The experts analyzed their accumulated data and found that pasta consumption resulted in significant reductions in body weight. But the findings do come with considerable caveats, and they should be considered before incorporating the delicious pasta into individuals' daily meals! Carbohydrates have often been compared to fats and considered as high-calorie foods. This food group has been believed to play a strong role in the development of metabolic disorders such as obesity. It has resulted in a dietary trend of cutting out as many carb-rich foods as possible. On the other hand, some carbohydrate types - smaller molecules such as oligosaccharides - are necessary for human health. Some individuals could benefit from a limited daily carbohydrate intake, made up of foods with a reduced glycemic index (a measure of the approximate numbers or availability of the individual subunits that make up carbohydrate molecules, which are sugars, found in an individual foodstuff). The more prominent of these include high levels of sugars that their intake may confer. High-GI molecules may be delivered to the body in forms that are more likely to be stored as fat rather than used as fuel. A chronic intake of high-GI foods may also lead to changes in the body's metabolic processes that push the body into a state of obesity over time. Therefore, eating such foods increase the risk of developing significant fat deposits under the skin. These may, in turn, accumulate in specific locations (e.g. around the abdomen). Can Pasta Be Considered Healthy? Some types of carbohydrate-rich foods are not broken down into stored fats so easily. Thus, they are better sources of energy. 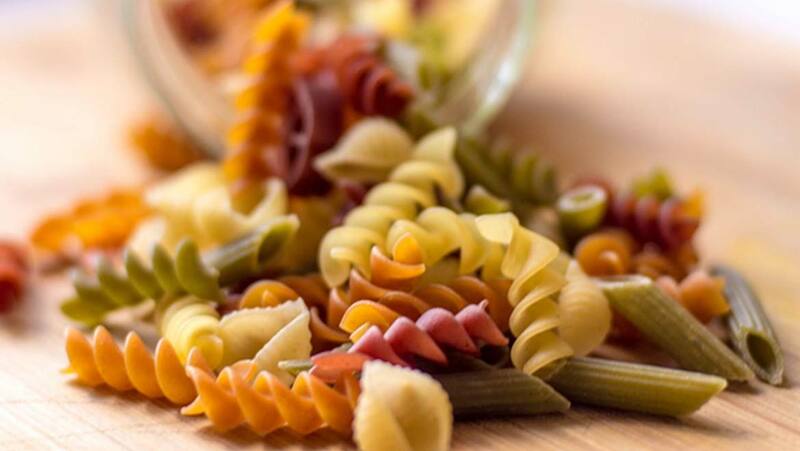 Pasta is one example of these low-GI carbohydrate sources, which could also signify that they are less industrially refined. Therefore, this Italian staple could make up part of a healthy diet. These stats could put to rest a number of studies on the effects of pasta on weight gain and related risk of body fat accumulation. Researchers from the Universities of Saskatchewan and Toronto, and Toronto's St. Michael's Hospital, systematically evaluated these studies. The team looked at data from 32 trials and reviewed them in terms of body weight changes, body mass index (BMI), waist circumference, waist-to-hip ratio, and actual magnitude of abdominal adipose tissue (abdominal fat which is often taken as a marker for obesity). The analysis resulted in findings that experimental diets which included pasta resulted in significant body weight reductions compared to control (increased GI) regimens. However, no similar effect was found for the remaining outcomes, although there were no negative effects reported either. However, the trials included in this review concerned pasta intake in conjunction with additional low-GI foods only, and not of more typical diets. The researchers reported that they could not establish the outcomes they wanted. For instance, the effects of pasta in isolation or as part of participants' regular diets. In addition, the quality of the data provided by the 32 trials was assessed and judged "moderate". This new review investigating the effects of pasta consumption has concluded that it does not result in increased body weight. It was also not associated with changes in other measures of body fat accumulations or obesity. So, it can be concluded that individuals wishing to maintain their current weight and continue enjoying pasta could benefit from reducing their current intake of high-GI foods to get the most benefit. Those who are already on a low-GI diet could now feel less guilty after the occasional bowl of meatballs and spaghetti! Chiavaroli L, Kendall CWC, Braunstein CR, Blanco Mejia S, Leiter LA, Jenkins DJA, et al. Effect of pasta in the context of low-glycaemic index dietary patterns on body weight and markers of adiposity: a systematic review and meta-analysis of randomised controlled trials in adults. BMJ Open. 2018;8(3).